As a borderline crazy runner constantly chasing personal bests, I'm obsessed with finding ways - technological or otherwise - to improve my training and performance. I've done some frankly extreme things in the pursuit of marginal gains; spent days cutting millimetres off plastic packaging to shave 100g off the weight of my backpack during the Marathon des Sables; sat for hours in saunas trying to become a more efficient sweater; I've even done Toe-ga - a series of toe exercises designed to give you better running posture. I've tested dozens of gadgets that all claim to make you fitter, faster, stronger, better. So when I heard about a new brain-training tool that promises double-digit performance gains, I was immediately interested. Particularly with a 100-mile ultra marathon looming. The tech I'm talking about is Halo Sport, a set of space-age headphones that use complex science called neurostimulation to help you train more effectively. Oh, and also play music. Now, headphones that mess with your brain might sound like far-fetched science fiction but with Olympic gold medal winners, NFL stars and legends like Michael Johnson lining up to endorse them, I wanted to see if this cutting-edge headset really could give you the edge. Developed off the back of 15 year's academic neuroscience research, Halo Sport works on the basic principle that the brain learns from repetition. Whether you're studying a language, or trying to sprint 100m in under 10 seconds, this innate ability to adapt to training and learn new skills - Neuroplasticity - is what drives human improvement. The scientific expression of the old adage 'practice makes perfect', repetitive training is what enables the body to reproduce the required strength and skill more easily when it comes to game time. There's one problem with this: Perfecting a skill can take a long time. Thousands of repetitions might be needed to reach the levels of performance you're chasing – and that's where neuropriming comes in. By stimulating your motor cortex for a period of 20 minutes during athletic training (neuropriming) and increasing the excitability of motor neurons, Halo Sport puts your brain into a state of heightened plasticity known as "hyper plasticity" or 'hyperlearning', for up to an hour. During this time, the brain's ability to adapt to training becomes more potent and that allows an athlete's brain to learn quicker and achieve results faster. 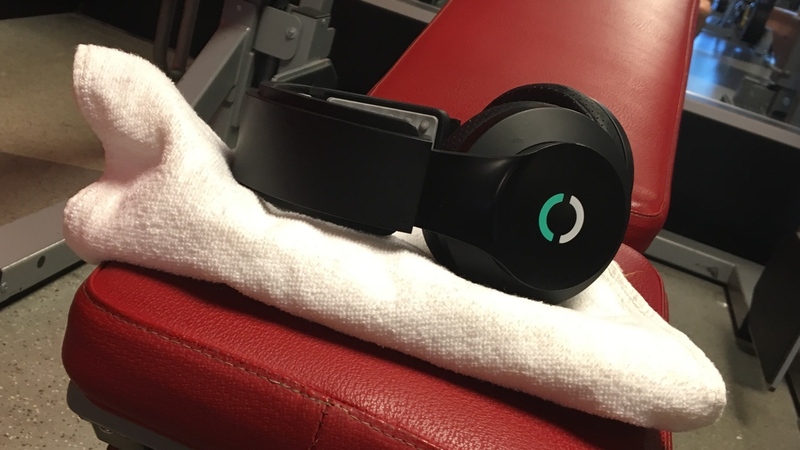 Put more simply, Halo argues (with the considerable weight of scientific evidence to back it up) that wearing the headset during your toughest, highest quality workouts has the potential to accelerate gains in strength, explosiveness, endurance, and muscle memory. It can make not just every training session, but every rep, more effective. Before we go any further, if you're expecting me to tell you with scientific certainty whether Halo Sport works, you might be disappointed. There's a good reason for this: I'm not a scientist, and this wasn't a scientific test. If it's hard proof you're after, there are plenty of scientifically rigorous studies that have produced evidence to show Halo Sport can improve performance. What I can reveal is whether I feel like it's worked for me – and whether Halo Sport has earned a permanent place in my kit bag. From the price tag alone, it's pretty clear Halo Sport is aimed at very serious amateurs and upwards, all the way to the elites. Performance has to matter a lot if you're considering parting with $699 (around £550) in search of marginal gains. This isn't a tool for the occasional marathoner, or someone who's about to do their first Tough Mudder. With a 100-mile ultra marathon a few months away, I'd class myself as a serious amateur and to put Halo to the test, I paired it with my weekly training plan, which consists of two upper and two lower body strength sessions in the weights section at the gym, one track-based speed interval session and one long, slow run. Even before I'd put them on, I had a niggling question: While there were plenty of stats and tests which proved they'd worked for people like the US Olympic Ski Team or the Invictus CrossFit competitors, how would I know if Halo was working for me? I then used Halo Sport during a number of different sessions each week and, following the guidelines, wore them for 20 minutes during the most important part of my workout. Setting up Halo Sport takes about five minutes and is extremely simple. Download the partner iOS or Android app, pair the headset with your phone and you're good to go. Before each session, you need to wet the nodules on the soft foam primer pads which you can do with the water bottle supplied, or just run them under the tap. At this point, you will get a few looks from fellow gym goers. The headset is worn just like any set of over ear headphones, you just need to ensure there's good contact between the pads and the top of your head. You'll see in the app when you have a good connection and you can then use the app to adjust the strength of your neuropriming using a 0-10 rating –10 being the strongest. Halo recommends setting this to a comfortable level. For me, that was at seven out of 10. Any higher, and the tingling sensation became more like a hard hairbrush scratch that bothered me over time. Once that's done, you simply hit Start and you're free to train as normal. The headphones work via Bluetooth, or you can use the headphone cable supplied. Once you've started priming you can also leave your phone behind and Halo will continue to work. The headset will beep if your priming pads lose connection, and you can adjust accordingly. They'll also beep after 20 minutes to tell you when the priming phase is complete. New fitness tool, or goodbye bulky cans? For any fitness gadget to be successful it has to do a couple of things. Firstly, it has to fit seamlessly into your fitness routine without any serious inconvenience. Secondly, it needs to have a demonstrable benefit. If you can't point to a statistic or a moment of success and say that happened because of this, then it instantly begs the question, 'Why am I using this?'. After using it for a month, I found that Halo Sport had some problems on both fronts. First up they're not that convenient. At 340g, the headset is about as hefty as any set of sports headphones get. They come with a really nice protective carry case, but it takes up a considerable amount of space in your bag. If like me you train before work, during lunch or run home, then having another large item to cram into your bag isn't ideal. Of course you could transport them around your neck, but I don't think I'm being overly harsh in saying that these are statement headphones. They draw enough attention on the gym floor and they're not really stylish enough to cut it as casual commuter cans. If you're a fan of lightweight in-ear headphones or subtlety, then I fear these might not be for you. They aren't the best looking and they aren't the most comfortable sport headphones I've worn. However, if you're more bothered by how you perform than how you look, and you can handle a little discomfort for the greater good, then this might be a moot point. Perhaps the bigger problem though is the lack of any feature in the app to help you measure your improvement. The only function the app fulfils is starting and timing your 20 minute neuropriming sessions. Sadly, it doesn't record how many sessions, or what type of sessions you've 'primed', or let you log any performance metrics in relation to that session. Right now, the onus is on the user to bring all of the coaching intelligence. For example, it's up to you to work out how to benchmark your training so you can see if Halo Sport is working. This might not be a problem for a professional athlete with a back up team of coaches and sports scientists but even as experienced amateur athlete, I found it a little daunting and complicated. What Halo really needs is some useful guidance on how to benchmark performance and monitor progress. Something that makes your gains feel more tangible. The post-workout feedback is also non-existent. Once you complete a 20-minute session, all you get is a few beeps to say you're done priming. Even the addition of simple audio commands, like those you now get as standard fare on most running apps, would be a step forward, and we'd love to see Halo partnering with other tracking apps so that you can keep a record of the sessions you've primed. Can feeling, not seeing, be believing? All of this doesn't mean that Halo Sport doesn't work – far from it. I am noticing improvement. After a month, I'm lifting more weight in a lot of my strength drills, my 400m intervals on the track are 2-3 seconds faster, and I'm running better on my long Sunday runs. Can I definitely attribute this to Halo? Not exactly. Experience tells me that I'd expect to see improvements in all of these areas simply from following a more structured training regime, improving my nutrition and being more committed to my training. The real question is whether I'm seeing bigger, faster improvements as a result of wearing Halo Sport, and this is where I feel the app needs to help more. Not many of us will have the data required to compare current and past performance to be able to say conclusively, and without this Halo currently feels a little disconnected and intangible. You're being asked to put a lot of faith in a product that's not the easiest to incorporate into your routine. But then, this wouldn't be the first time I've done that. How do I know if my compression gear is really aiding my recovery? Or if my post-workout protein shake is optimum for my recovery? Or whether the expensive lightweight running shoes I've been wearing are making me faster? I don't. You have to go on feel. And that's the case here. If you're serious about the pursuit of a personal best, and you're willing to go the extra mile to get those marginal gains, then Halo could be the product that unlocks your extra potential. But if you're not that obsessive, or your livelihood doesn't depend on optimising every part of your training, then maybe you should just jog on.